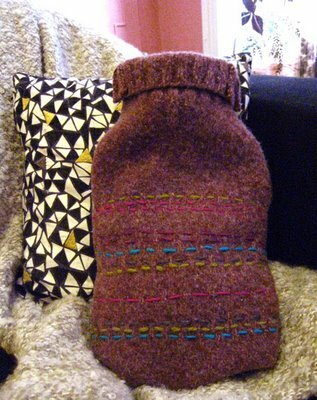 Why not recycle your old daggy jumper into a huggable cosy hot water bottle cover! It's super easy and quick to do. If you don't have an old jumper to use you can pick up some great ones at the 2nd hand stores. Here's how it's done. An old knitted roll - neck jumper. Pin your template piece to the inside-out jumper. 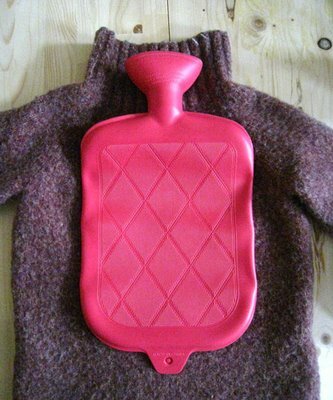 The top of the hot water bottle template piece (where you fill the hottie up) should be level with the top of the roll neck. Your jumper will be wider in the neck than your hot water bottle is. Now its time to start cutting! You need to cut your jumper in a "U" shape using your template as a guide. To cut the "U" shape, first cut around the bottom curve of the hot water bottle to match the shape of its bottom (you will need to add 1cm when you cut to allow for your seams / stitching) Next cut up each side of the template in a straight line all the way to the top of the sweater. Now its time to start stitching! Your jumper should still be inside-out. You need to sew from the shoulder seam down each side, around the bottom curve and back up to the other shoulder seam. Basically you are sewing a "U" shape just like you cut out. You can hand-sew this seam with small sturdy stitches, or you can sew on your machine for a fast result. Trim away any loose ends. 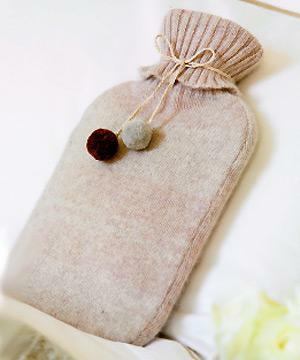 Now, turn hot water bottle cover in the right way out. That's it! Your done. 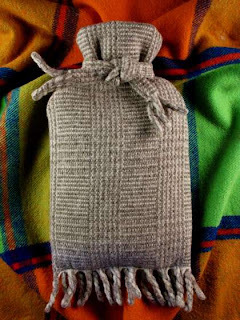 You can add ribbon or ties to the neck of your bottle if you choose like the following pictures or leave as it is. Time to get cosy! This is my blog about finding great things to do on weekends, DIY projects, fun adventures, must see places and being on a treasure hunt for all things inspiring and fun. I am a vintage, retro loving vegetarian who loves camping, the outdoors, finding great markets, cooking and eating out, going on road trips, cocktails and living as ECO friendly as possible. Welcome to my blog. Please share your ideas and thoughts. I hope I can inspire you to follow my treasure hunt and to experience some of my ideas and adventures for yourself.